In a burst of extraordinary color, our new Vermilion palette adds its voice to our chorus of Cashmere Ombré Wrap Kits! 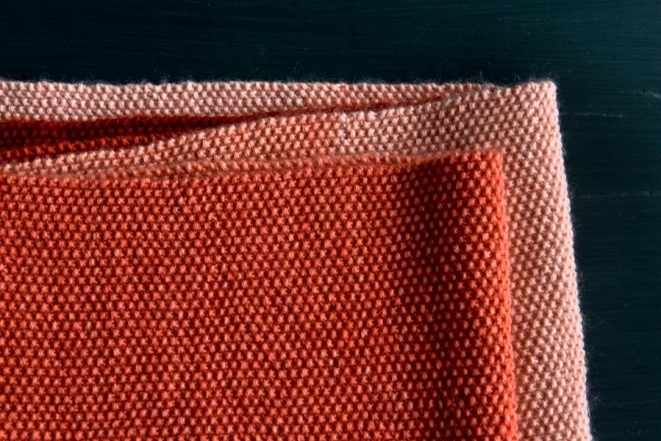 Rich and evocative, warm and sophisticated, Vermilion’s song ranges from deep carnelian bass notes to light peach blossom trills. 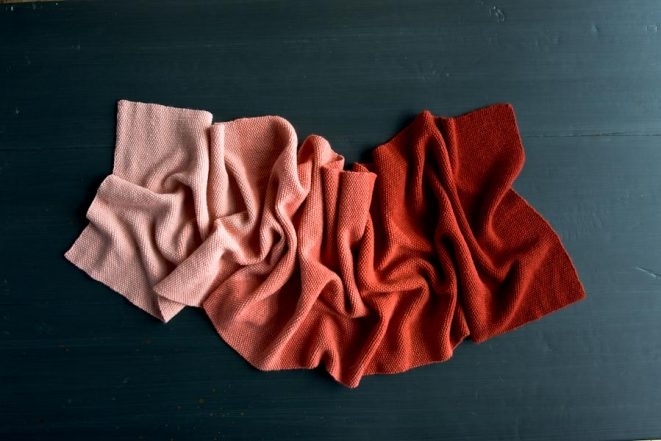 In partnership with our favorite cashmere yarn creators, Jade Sapphire, we designed our Cashmere Ombré Wrap around the idea of an octave of color: eight skeins of the finest Mongolian cashmere we have ever touched, dunked into a dye bath and pulled out at equal intervals. 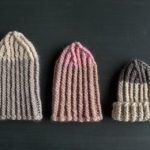 In whatever color you love, the result is pure knitting joy! We’re thrilled to welcome Vermilion into the family. It seems to hit winter’s surprising notes of color: a patch of lichen on a log, an autumn leaf clinging to a branch, a red squirrel looking for its lost nut in a bank of snow. To us, it is perfectly warm in feel, look, and spirit! 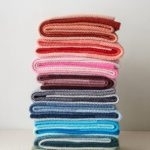 Our Cashmere Ombré Wrap Kit now comes in six incredible colors: Vermilion, Plum, Bloom, Fog, Ink, and Aquamarine. Choose your favorite! I’m in love, I’m in love and I don’t care who knows it. It’s B. U. Ti. Ful. I’m ordering it right NOW! Would love to see this in maroon/crimson next. I just adore this wrap! Could you give a guess as to know long this would take to knit? The thought of those tiny needles makes me cringe! Thank you for writing in! It is difficult to guess how long it will take any one knitter to knit this wrap or anything! It depends on how often you knit, how long each of your knitting sessions are and the speed at which you knit! This wrap is pretty big and the needle size is quite small, so perhaps this could be a long-term project that you work on when you need a break from less time-consuming projects? What size cable for the circular needles? Thank you for writing in! A 24-inch or 32-inch would work just fine for this this wrap! Please let us know if you have further questions. I love this wrap and pattern. 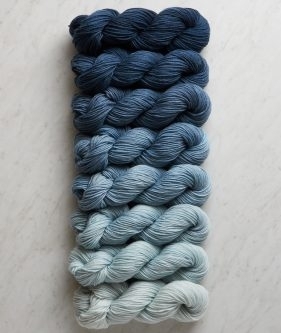 Do you have any yarn recommendations that are more affordable? 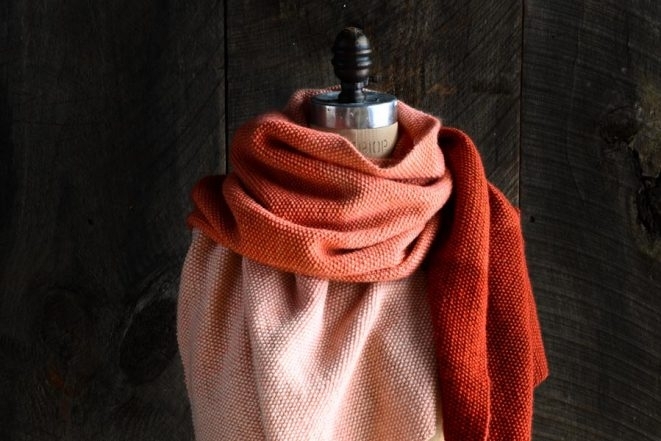 I am so glad that you are inspired by our Cashmere Ombre Wrap. I have helped several customers with color combinations using more modestly priced yarns. My favorite alternative is our Line Weight. 3-4 skeins of line weight would yield a similar length wrap using the same cast-on numbers and needle size. 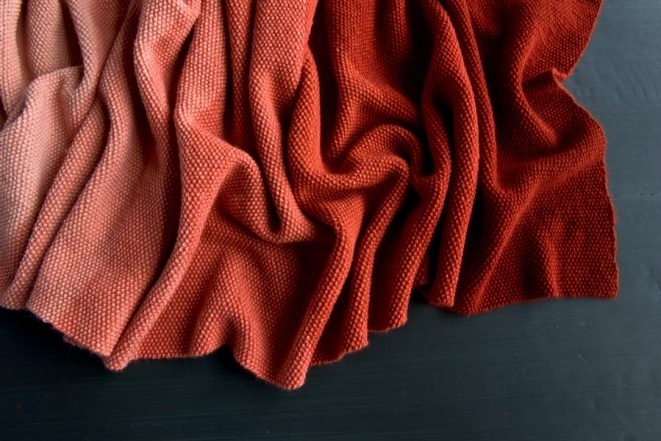 Additionally, some knitters have used our Gradient Cowl as inspiration, holding two strands of Line Weight together to create an ombre effect. I have received this wonderful kit in a beautiful box with a pretty and useful bag . Thanks a lot for your lovely website. Please can you advise if you ship to the UK or if you have a stockist here. Would love to make a purchase if possible? 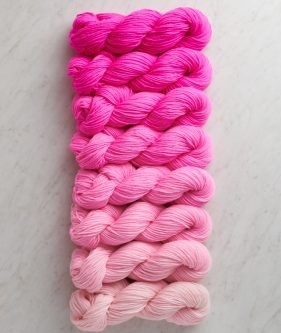 Would it work to use these yarns with the pattern for the Tunisian crochet scarf? Thanks for writing in! Yes! 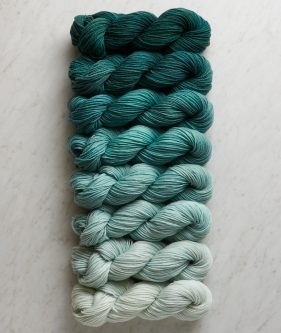 These yarns would look amazing in Tunisian crochet. I think you should go for it! Happy crocheting! 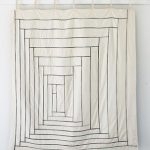 what is the skill level of this pattern? Great question! 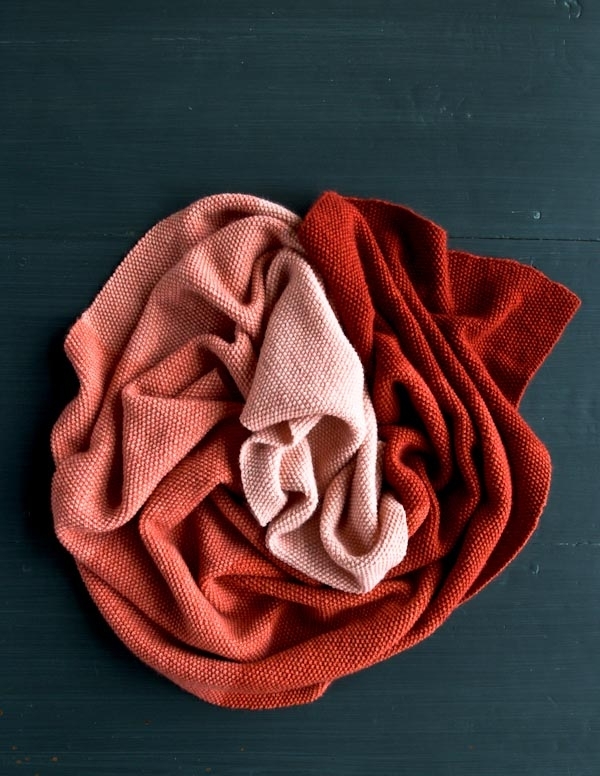 The Cashmere Ombre Wrap probably falls into the realm of advanced beginner. For both the seed stitch pattern and the mistake rib, you will only need to know how to knit and purl. It is a bit of a time commitment if you aren’t a speedy knitter yet because it’s a fairly small gauge but they yarn is really lovely to work with! I’m a beginning knitter ( who makes boo boos here & there) who just knows how to do the knit and purl stitch. Do U think I could handle this. It’s SO beautiful! Great question! 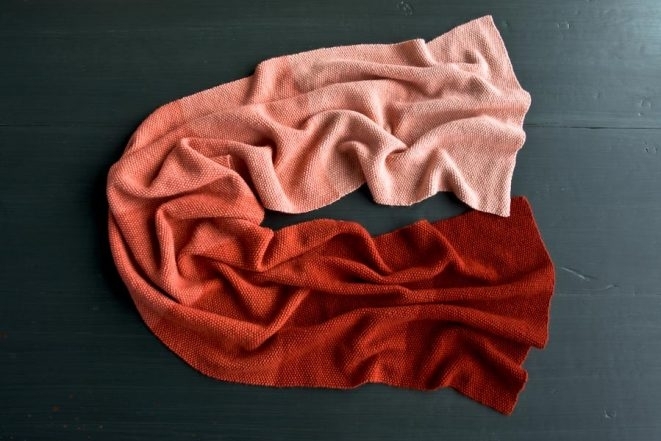 The Cashmere Ombre Wrap probably falls into the realm of advanced beginner. For both the seed stitch pattern and the mistake rib, you will only need to know how to knit and purl. Mistakes in these patterns are easy enough to fix and I find that YouTube is helpful for this as can a local yarn store. If you are local to NYC, you can certainly come visit us! It is a bit of a time commitment if you aren’t a speedy knitter yet because it’s a fairly small gauge but they yarn is really lovely to work with! Just got the patern to make this wonderful partern. But not sure what K1 and P1 means. How can I get this explained to me ? Thanks for writing us! K1 = knit 1 stitch and P1 = purl 1 stitch. Hope this helps! I hope that this is helpful and happy knitting! I would love for this to come in an emerald green in the future!! Thanks for the comment! We will keep it in mind for future ombre wraps. In the meantime, the aquamarine color is a beautiful option! Can you suggest another yarn to substitute? I love it but can not afford the cashmere. 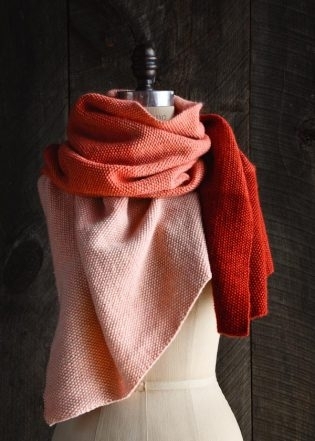 So glad you love the Vermilion wrap! It is quite expensive, but oh so luxurious and soft. 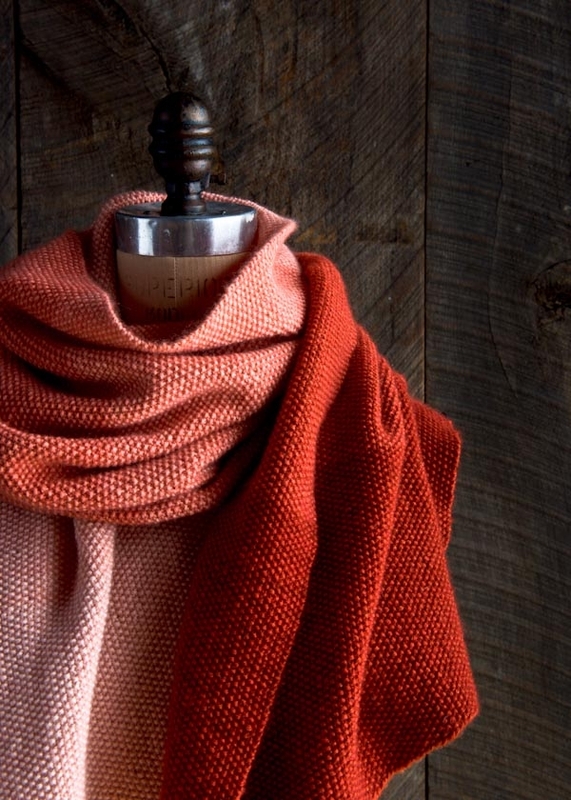 There aren’t many yarns that quite match the seamless gradation of the Ombre Wrap, but I do suggest looking at Koigu KPM for their beautiful oranges and red-oranges. Thanks for writing in! I’m really interested in getting this kit, but I’d like the color transitions to be more subtle than what I’m seeing in these images. Can you suggest any modifications to the pattern that would smooth out the transitions? 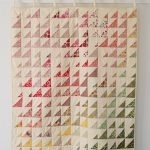 (I’m wondering, for example, if alternating colors for a row or two – either by stitch or by row – would do the trick?) Thanks! Thanks for writing in! The transitions between colors on this lovely wrap are slightly more subtle in real life. 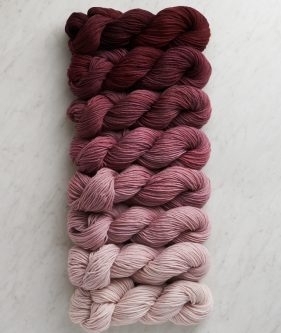 However, due to the hand dyed nature of these skeins, kits can vary. 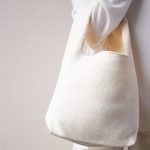 The idea that you present is fabulous and something that is frequently used when knitting with hand dyed yarns. Near the end of each ball, you can begin alternating the old color with the new color every two rows for the last inch to 2 inches. This should lead to a more smooth and subtle transition. Thank you, Cassy! I’m going to try it! Thanks for writing in! The yarn for this lovely wrap is only available in the kit and is dyed specially for it. 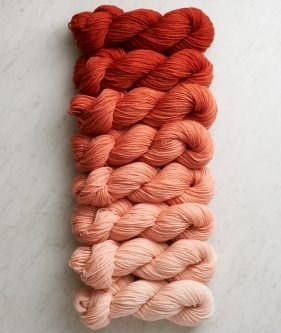 While we do not have any other purpose dyed gradients, you can certainly put together a gradient using other yarns. 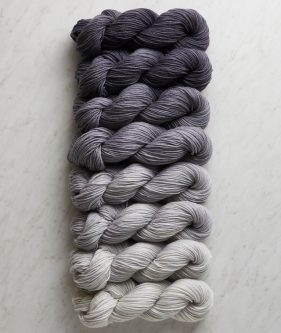 A popular one that we see in the shop is using Woolfolk Far or Tynd to make a black to white gradient. You can then use any stitch pattern that you like! I hope that this helps and please do let us know if you have any further questions! How would this wrap be in an 8 ply cashmere! Thanks for writing in! 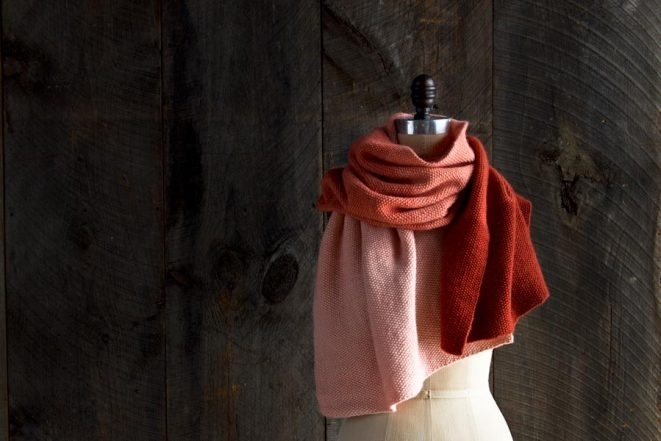 I think that a similar wrap in 8 ply cashmere would be lovely. 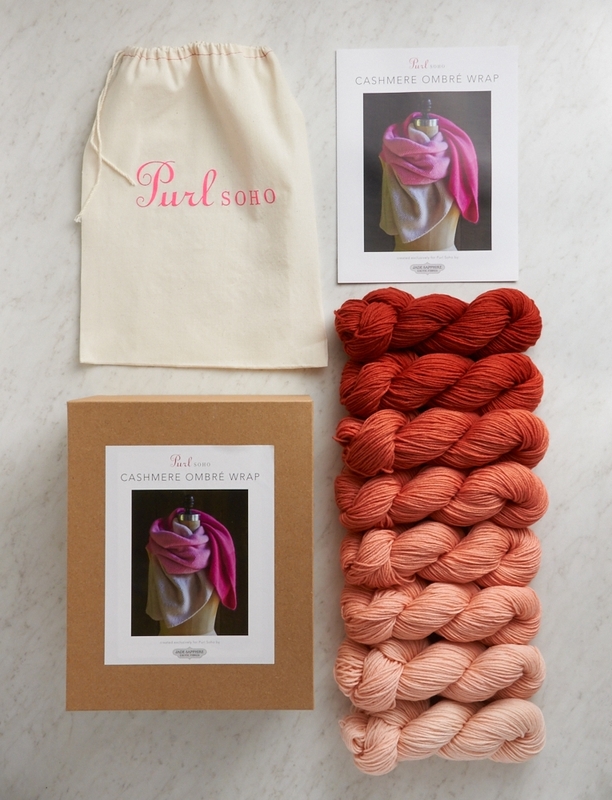 Please note that the yarn in this kit is dyed specifically for this kit and is not available outside the kit in other thicknesses. You can make your own beautiful color block version by picking colors that speak to you in Jade Sapphire’s 8 Ply Cashmere. The resulting wrap would be so warm and cuddly! This is so beauitful. What level of skill would this require? Thank you for writing in! I would say an experienced beginner. Seed stitch and Mistake rib (The two pattern options for this beautiful wrap) are both pretty straight forward. Both of these patterns consist of deferent alternating knit and purl sequences. The only caution that I would present is that this wrap is done on rather small needles and as such takes a fair amount of time to complete but it is well worth it! So amazing. Going to take the (financial) plunge and buy it today for my mom’s bday present. Question: would it be OK to add a selvedge (slipped) stitch on each side? I’m just not a fan of the “nubbies” that appear for this stitch at edges. Maybe it’s a bad idea b/c I’d have to switch colors on st #2 of the row and that will show? Any advice much appreciated! Thanks for writing in! What a amazing gift! You can certainly skip the first stitch on each row if you like. Just be sure to count this as your first knit stitch and continue on with the pattern as written. For color change rows, you can skip this slip stitch without much issue as it will be for only a single row and the yarn is quite thin! One more color to go. This is a fairly large garment and am wondering about your suggestions on blocking it. Thank you for reaching out and congratulations on being almost done with your wrap! The key to blocking this project is finding a large enough space to let it lay flat. With things this large I use a blocking mat on my floor. For more tips and insights check out our blocking tutorial. I love this ombre wrap! I just finished knitting it in “plum,” and I’m ready to knit it in the “fog” colorway next. Any idea when you’ll have “fog” back in stock? How lovely! You are in luck! We just got the Fog back in stock!